For your Vermont get-away, a wonderful home away from home, welcoming, cozy, comfortable, with luxury details, and sited on the most impressive location in Manchester Village. The house abuts and overlooks the protected 40 acre Hildene Meadow, now a special heritage farm, with mountain views, and gorgeous sunsets. Our home is completely outfitted with the finest handmade furniture, the best of beds and linens, flat screen TV, high speed internet, game room, ping pong table, wood burning stove, central air, patio and a screened porch. Barbeque out back, watch the sun set over the mountains, enjoy an evening around the fire pit or gather together in the screened cottage. We are four minutes from the Equinox Resort & Spa, the Hildene Estate, the Gleneagles Golf Course, and 15 minutes to Bromley, 25 minutes to Stratton Mountain, and 20 minutes to the Vermont Summer Festival Horse Show. A perfect location as we are 5 minutes to the center of Manchester offering shopping, restaurants, galleries, and antiquing, yet you will feel as though you are is the heart of the Vermont countryside. With all the comforts of home this is the perfect location for a family gathering, or time spent with friends. This house was originally purchased to be part of the inventory for a high end vacation home club. It was furnished, outfitted, and detailed with this purpose in mind. The business was ultimately sold, but we retained the property. Our family has enjoyed many gatherings at this wonderful home, as have numerous guests. We welcome you to also enjoy a special experience in a home away from home. We sought a house in a location that had the feel of being among the mountains and meadows of Vermont, but not isolated. We are minutes away from everything, great restaurants, shopping, art galleries, antiquing, spas, and all the sports associated with the Vermont seasons. Bathroom 1 has radiant heat floors and Waterworks Fixtures. Sit on the patio,look over a 40 acre meadow, and watch the sunset over the mountains. Fully equipped for all occasions. 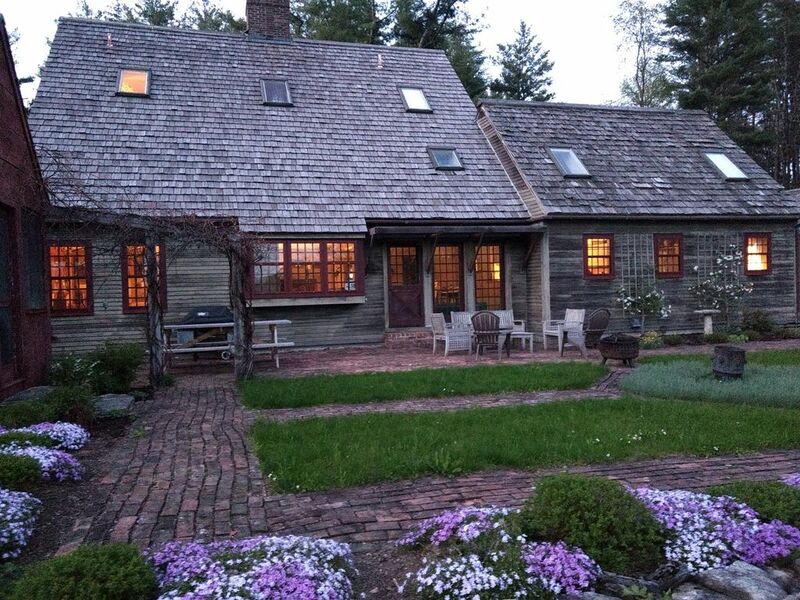 This was our third time renting this house in Manchester, VT. We love the house - it is spacious, with charming (usable!) nooks and crannies. One "extra" room became our game room; another the music room; and another was our lounge. And these are just the "spare" rooms! This was our first winter visit and it was perfect -- a wood burning stove, hiking on adjacent trails, family dinners in the dining room. If you can imagine what a quintessential Vermont experience is, this is it. We have found the owners and house manager always approachable and helpful. If you rent this house, we hope you love it as much as we do! Wonderful having you visit again. I am thrilled you love our home in all seasons, it is a special place. You are welcome anytime. What a wonderful house! On top of being a beautiful, comfortable house, it was unbelievably clean and well appointed for 4 couples. Beds are comfortable--everyone remarked in this--and the view of the mountain behind the house is gorgeous. We also enjoyed the garden and the outdoor living room! A memorable stay! Wow, and I didn't even get the time to ask for a review. Come back anytime! This was my family's second stay here and we had a wonderful time! The location is perfect, just down the road from town, and the view from the back of the house is idyllic- beautiful mountains everywhere! Our three small boys and our dog love romping in the backyard together. We love going to Vermont each fall and this house makes the trip even better- it's a beautiful property, well maintained, and Ariane could not be more pleasant or accommodating. We will be back! So great to have you and your family back again. You are on your way to joining several families who make a visit to our home an annual gathering. We look forward to welcoming you back to River Road. Thank you for your kind words. The home and property were amazing! Very clean and comfortable. Lots of room for our group of eight. We thoroughly enjoyed this home and definitely would book it again. There was so much room for our family to “spread out”. The bedrooms were gorgeous and the beds were very comfortable. The outdoor area was nice...pretty flowers growing along the back of the house and a beautiful view to enjoy. Thank you for supplying firewood. We even had a cozy bonfire one night. The house has an historic feel and look to it to go along with the area it is located in, but it is a newer home where everything is in good working order. The bathrooms were beautiful as well! They had some unique architectural features and were very clean. The property owners have thought of everything with this rental. They supplied everything we needed to make it a wonderful stay. We didn’t have any babies with us, but they have many of the things you need if you’re traveling with a young family (crib, high chair, etc.). Veronica, our hostess, greeted us on our first day there and she couldn’t have been more welcoming! She answered our questions, made sure we knew where everything was, and she even made some recommendations for things to do in the area. Before leaving, our family tried to think if there were any recommendations we could give the property owners, but we couldn’t come up with even one suggestion. This home, the owners and Veronica the hostess, met and exceeded all of our expectations. I would (and hope to) rent this beautiful home again without hesitation. Anyone who stays here will fall in love with this home! This was our second stay at this charming Manchester home. We love this house and property! It is an special oasis in a wonderful town in a wonderful state. We particularly enjoy the garden, outdoor seating and the delightful screened in porch. Our two Portuguese Water Dogs enjoyed walking in the yard and hanging out in the sunshine. Should our travels take us back to Manchester, we would choose this house for the third time without hesitation! It is always rewarding to welcome back return guests, it means we are doing something right in providing a home away from home. Thank you Jesse for taking the time to write this excellent review, and we look forward to hearing from you yet again. Our second time staying at Simicity and it remained perfect!! Owner Ariane and her home are equally amazing. There is so much to love about this house. Ariane, thank you for being the consumate professional and for the hospitality. Veronica your housekeeper was wonderful also. It was wonderful to have you and your family back. We do try our best to make visits to our home the best they can be, and I thank you for recognizing that. We look forward to hearing from you again. Happy New Year. Manchester is home to many fine restaurants, art galleries, antique stores, and outlet shopping. The Northshire Book Store is rated 7th in the country. Several great golf courses, fly-fishing, Orvis Fly-Fishing School, and the British School of Falconry are all close by. Of course, hiking & biking, skiing, snowshoeing & sledding. Minimum of 5 night rental in July and August Inquire about Winter Monthly Ski Season rates. Monthly rates available upon request Holidays may have a 3 to 4 night minimum. Weekend Holiday rates may differ Cancellations will be refunded provided we can rebook the dates.